Similar to all cruise lines, Princess offers a wealth of excursions at each of their ports. These range from city sightseeing tours to zip lining and horseback riding if you prefer something strenuous. The key is to go to their web site and determine what you might enjoy doing depending on the tour length, activity level, and cost. Be sure to read the full description listed for each excursion. Many have short videos you can watch. However, remember those videos hype what each tour offers. Since they are so short, sometimes you don’t get the full picture. It’s up to you to look up the sites you are interested in visiting on the Internet. Just Google them. Keep in mind there is a definite difference when a tour lists stopping at or visiting. Visiting means you might actually get to see something while stopping can be just a photo stop. Detailed descriptions usually list how much time is spent at each attraction. Remember tours are like taking sips at a port rather than gulps. They give you an idea as to whether or not you want to return to an area. When in port for a full day, an option is to go with some friends and book a taxi. A second option is to pre book a tour or sightseeing cruise from a firm other than the cruise line. These can sometimes be customized to what you want to do. In Alaska, I have rented a car for the day. This is easy to do in other U.S. cities. All of these ways can save you substantial money over what the cruise line is providing. When you only have a couple of hours, booking a ship excursion guarantees you won’t be waving at the ship as it leaves for its next port. The ship will not depart until all their tours are back. If you are stuck in traffic, in a taxi, in a crowded city, such as Cartagena, it can be very stressful trying to return on time. In these cases, where you are limited to four or five hours, booking an excursion is a wise choice. I learned two years ago, on a cruise embarking from Houston, that the prices Princess quotes on their web site under excursions are not always what you may pay on the ship. They say the word “from” when listing their prices. If you complain about the difference on board, they will point out this little word to you and call it a discount for booking in advance. The word “discount” is never mentioned on their site or booking page. Some excursions go up from the price quoted while others stay the same. You aren’t told in advance which excursions will cost more on the ship than if you pre booked. So you are forced to pre book all excursions if you want to save money, even if you want to attend port talks on board before booking. It’s still wise to attend port talks as you’ll see slides of the different tours and have your questions answered. You can always change your mind about taking a tour as long as you cancel within the stated period. You might find something that’s more to your liking than what you originally booked. But if you rebook, you will pay the price on board for the new tour. I had hoped to learn more about these policies. I also wanted to find out which are the most popular tours and which ones sell out at the different ports on Panama Canal cruises. Unfortunately, Coral Princess’s excursions director refused to answer any of my questions. He insisted I receive clearance from headquarters for any interview. Guest services sent Princess my list of questions and business card with my web site on day three of a 15-day cruise. The day before we left the ship, guest services suggested I approach the excursions director. He still would not answer any questions because Princess headquarters had not responded. So the following is what I learned from observation and from talking to other passengers. This is a tender port where you take small boats to reach land. Usually your ship will provide transfers via some of their lifeboats. At times, the port supplies additional boats. 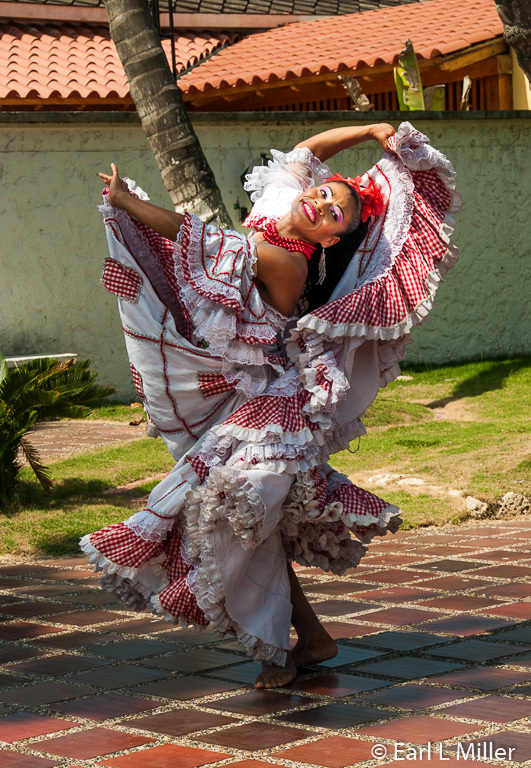 Cabo is regarded as one of the three ports for shoppers on the Panamanian cruise. If you’re interested in jewelry, particularly diamonds, you may want to spend your time checking out the stores instead of taking a tour. Several tours visit El Arco which is a hole in the rock. Save your money. Your cruise ship passes this site when you’re entering and leaving the port. You can photograph it while on board. The city tour, according to the cruise director’s port talk, was sold out on this cruise. Sometimes if a tour is sold out, check on it anyway to see if they open additional space. If you are interested in animals, one that looked interesting was the Desert and Camel Adventure. You drive out in 4 x 4 off road vehicles to the camel ranch. You can take an optional camel ride, go on a guided nature walk through the desert with a naturalist, then dine on a Mexican tortilla lunch with tequila after making tortillas. The excursions director highly recommended this tour. You can swim with the dolphins. Cameras are not allowed on this one since the professional photographer will try and sell you photos. I understand there is not much time in the water for this one. Other more active options are to go zip lining or a choice of snorkeling tours. Additional tours head for sailing, the beach or whale watching. Due to the whales migrating, the best time to see them is in December. Cooks may be interested in the Salsa and Salsa. They learn to make Margaritas and five different types of salsas. They also learn the salsa dance. 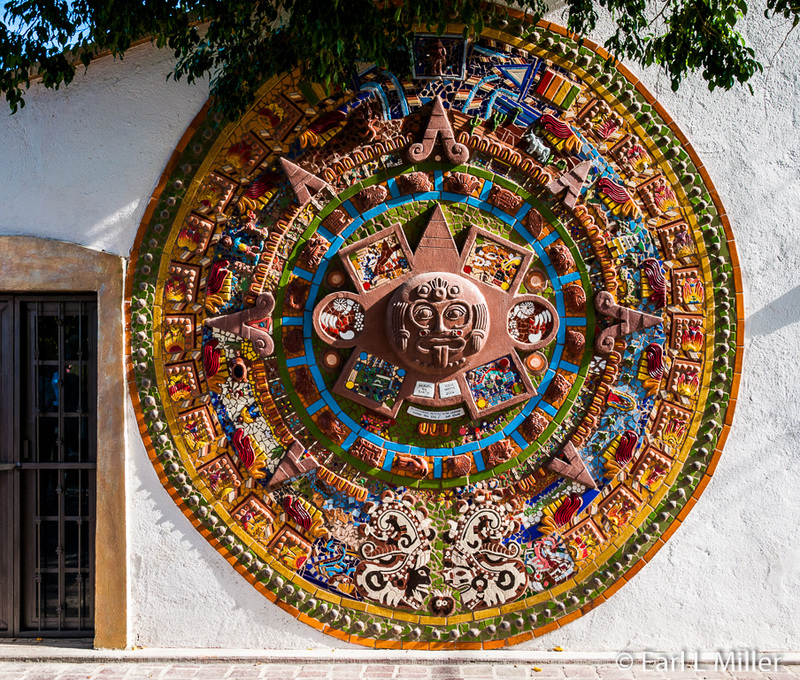 Since we had been to Cabo twice before, we took the tour to Todos Santos, to see Old Mexico. 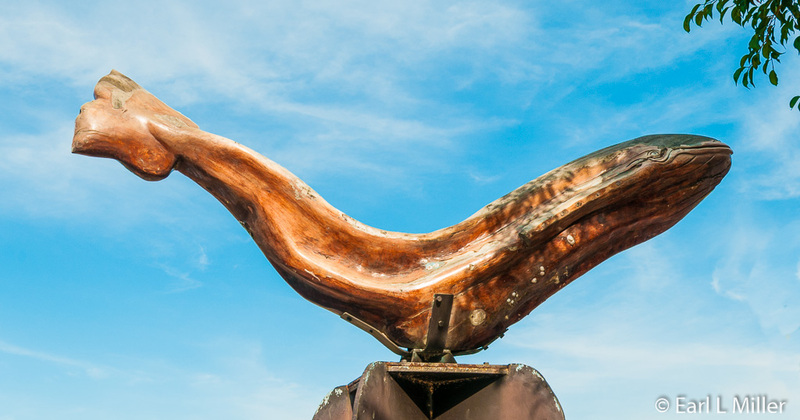 It was founded as a Jesuit mission, became the sugar cane capital of Baja, and is now a haven for artists and farmers. It takes over an hour and a quarter to drive there. We visited the cultural center, the mission, and the two town plazas then had lunch at Hotel California. We also had time to shop at their shopping center consisting of two leather shops, jewelry shops, a souvenir store, and more. I was surprised that we had a substantial lunch since only a light refreshment had been mentioned in the description. 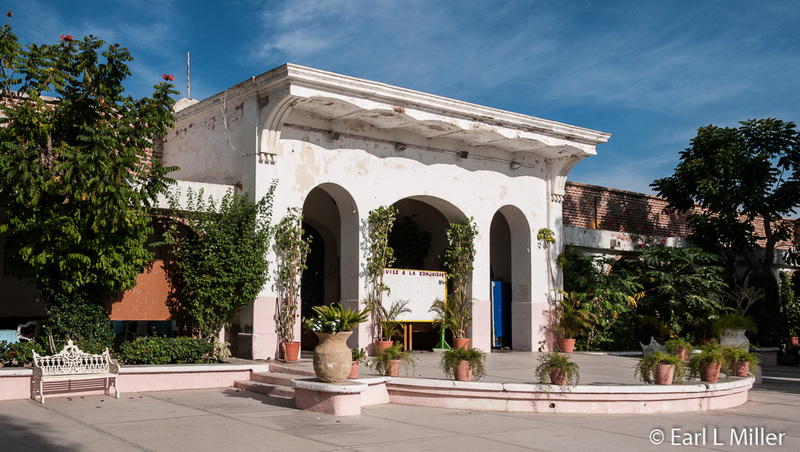 Casa de La Cultura, a converted school, contains a modest display combining Baja California’s history, including photos of early missions and Indian artifacts, with paintings by local artists, including ones of Mexican generals. Outside you’ll find a typical early adobe home containing a bedroom with an exterior kitchen. At the nearby plaza, note the Aztec calendar and the grey whale sculpture. 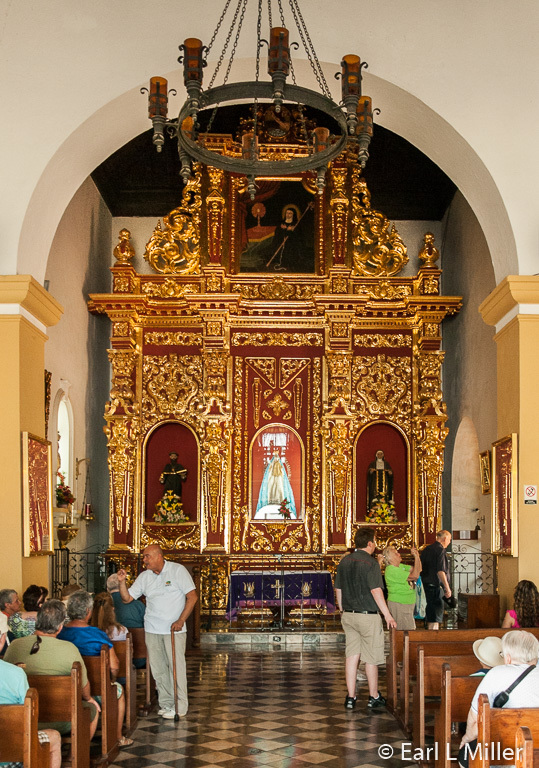 The church, Nuestra Señora del Pilar de Todos Santos, done in Baroque style, contains the original mission altar. Its heavy main doors and thick walls are clues that the building was once used as a fort to withstand Indian attacks. 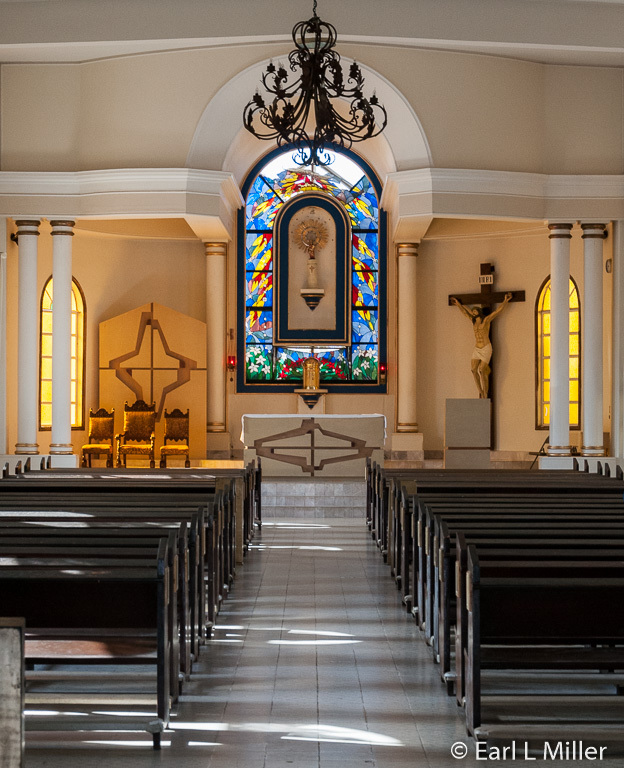 Founded by Father Jaime Bravo in 1723, it was originally called Santa Rosa de la Palmas, but that mission was destroyed by a native rebellion. The new mission served as Spanish headquarters until 1749. It originally consisted of what is now the vestibule. The building contains the statue of the Virgin of Pilar, the focus of the town’s main festival in October. 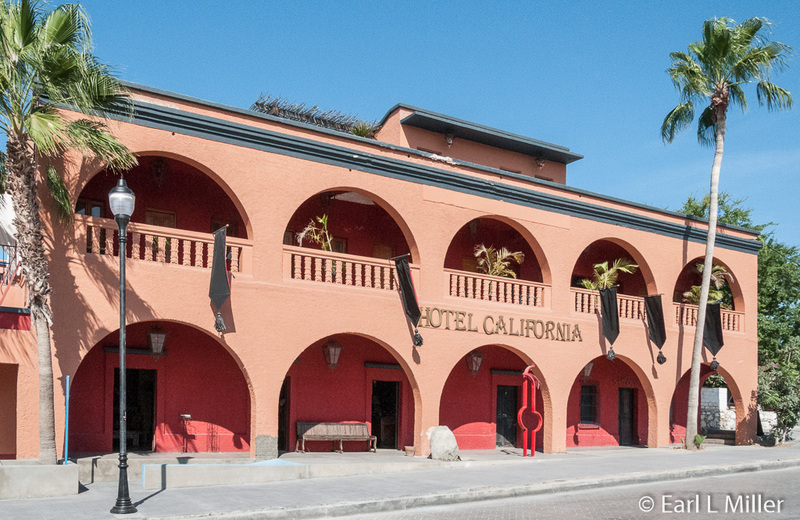 Hotel California is not the same one as the hotel made famous in the Eagles song in the 1970's. Don Henley who wrote the tune denies ever staying here. The rumor was started by a man who lived in town who wanted to generate tourism. Tours departing from this port offer several options. You can visit the country’s Poás Volcano, explore the rainforest, or visit a coffee plantation. Another combines a trip to the Scarlet Macaw Sanctuary with a boat trip through mangroves to see wildlife such as birds and crocodiles. For those seeking something more strenuous, they do have ziplining and white river rafting tours. One all day tour combines San Josè and Sarchi. This is a good one for first timers who prefer towns to rainforests. At Sarchi, known for its artists who decorate ox carts, you visit the factory where they do this. In San Jose, besides city sightseeing, you’ll visit San Josè National Theater and the National Museum. We took the trip which combined Rain Forest Adventures with Jungle Crocodile Safari. For $199 each, even though it was an all day trip, we found this tour overpriced. The first half of it failed to deliver what was stated on the web site excursion description. It said wildlife sightings and waterfalls. The trip to your first stop is a long one, several hours each way. 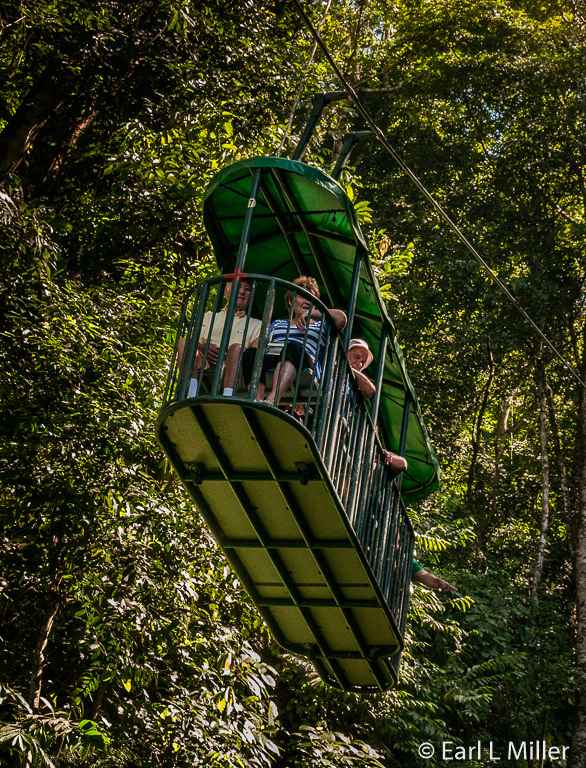 At the Rain Forest, we climbed into aerial trams seating eight passengers and a naturalist guide for a canopy trip over the rainforest. While it was interesting seeing the foliage, the chances of seeing wildlife are slim. We only saw two birds - a black-headed hawk and a turkey vulture. We also viewed, while on the tram, one waterfall, the Bridge Over Falling Water. 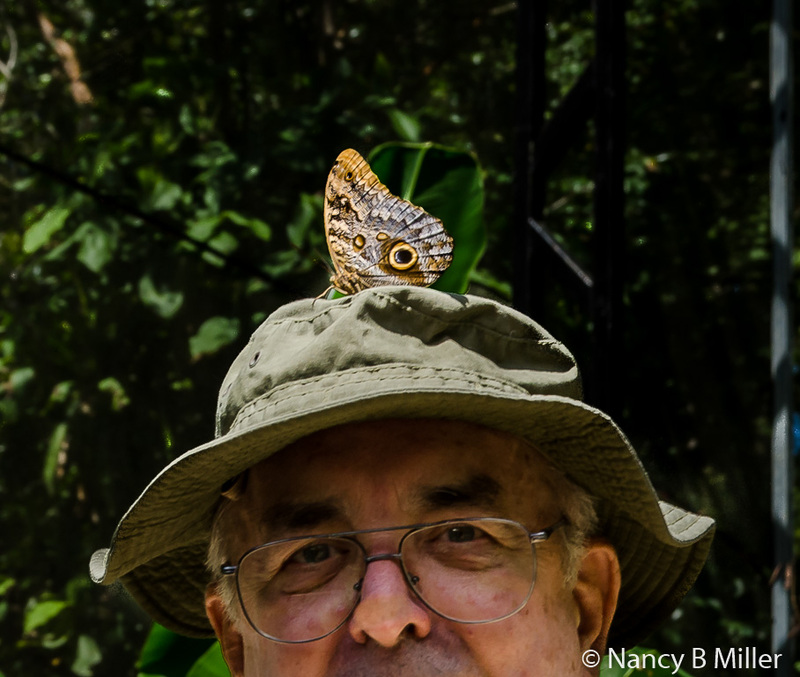 The butterfly garden consisted primarily of one species, the Calico Butterfly. One landed on Earl’s head and refused to move. I asked three people at the attraction about the naturalist-led hike and was told it was on flat terrain with a small hill. Common sense said for me not to try it. Earl did. He said several turned back at the hill since it was at a 45-degree angle and really required stairs. He had to go up it sideways. The Serpentarium, he saw, consisted of maybe four snakes in glass cages, a turtle, and a frog. He said the most interesting part was spotting ants on the trail hauling flower parts. Rain Forest Adventures does provide a good buffet lunch to cruise ship passengers. Besides souvenirs, their shop sells quality, reasonably priced wooden items, such as trivets for $10. 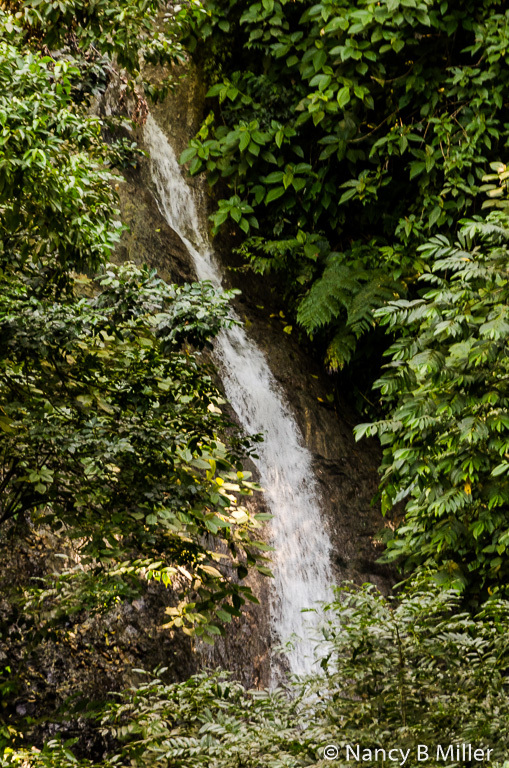 The company provides zip lining and waterfall climbing but not on this tour. 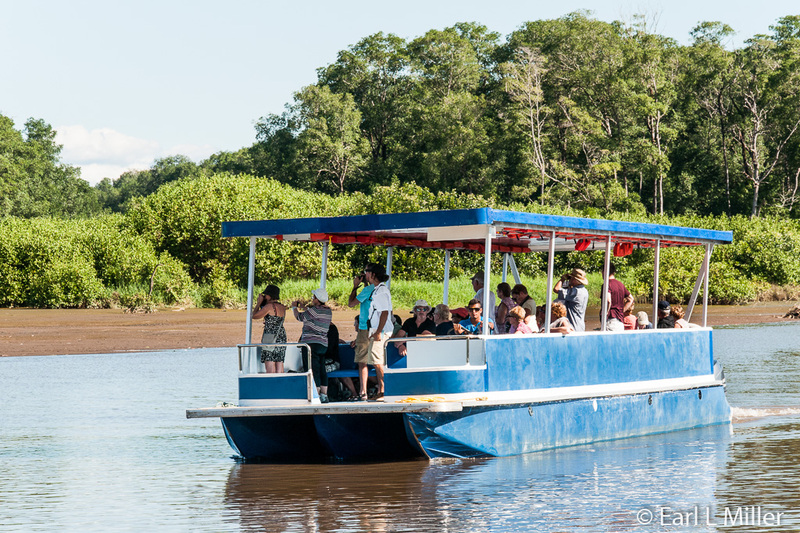 We thoroughly enjoyed our second stop, the Jungle Crocodile Safari cruise on the Tarcoles River. Our boat driver handed out a brochure with numbered photos of 60 different species. He was very good at getting us close to wildlife and even extended what is normally a two-hour tour. Since our tour guide from Puntarenas was a bird watcher, he was able to call out the brochure number for each of the numerous bird species we saw. We also observed several crocodiles up close. These reptiles are living dinosaurs since they date back 200 million years. We cruised the river and a mangrove estuary then rode out to see the pelicans lining the beach. When we returned to shore, we were treated to a Costa Rican fresh fruit buffet and water. We have learned, from our many trips to Costa Rica, that their pineapple is the best we have ever tasted. Another option combines a commercial railroad ride with the Tarcoles River trip. Our friends from California took this one and found the train seats, which reverse halfway through the trip, crammed together and not offering enough leg room. They also enjoyed the river cruise. Unfortunately, our time docked in Cartagena was only a half a day so we decided to take a tour. Traffic in Cartagena almost makes it impossible to move so a tour here is a wise move. Fortunately, some tours do allow for shopping since this is another port recommended for that activity. Our same friends went on one and advised us it was like herding cats. The guides did not hold their signs up high enough. This meant some people got on the wrong tour bus. Your choice of excursions at this port will include everything from city tours to a hop on/hop off bus to seeing such sites as La Popa Monastery; the fort, San Felipe de Barajas; Gold Museum, and the Old City, a walled portion of the original city with narrow streets. 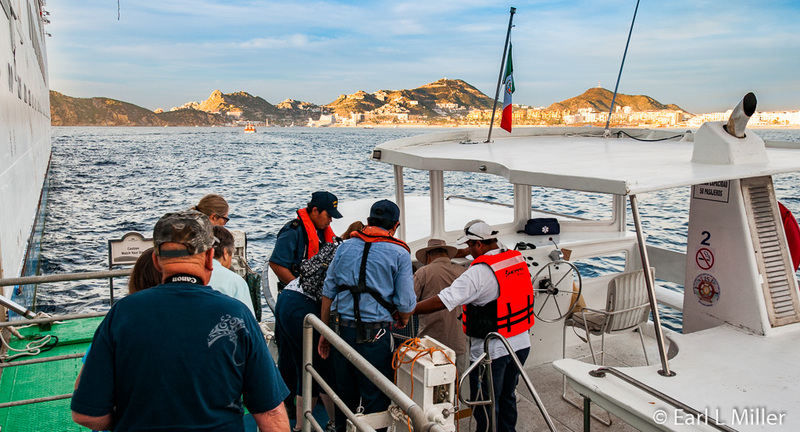 Unusual excursions include the emerald jewelry making class, folkloric dance show, Spanish galleon harbor cruise, and a horse and carriage tour of the Old City. Our first stop was La Popa Montastery, on the highest hill in Cartagena. After you climb the 15 stairs, you will find outstanding views of Cartagena, perfect for photographic shots of the city. 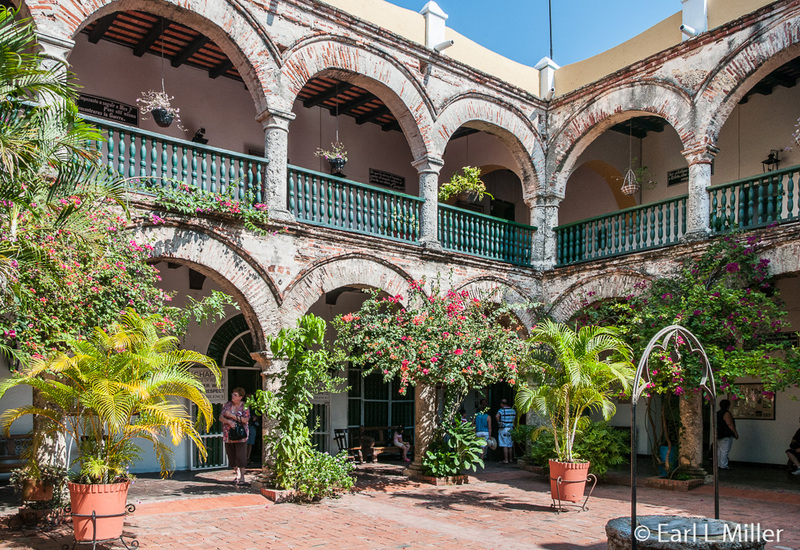 The convent was founded in 1607 by Fray Alonso Paredes, an Augustinian monk, who had a dream the Virgin Mary commanded him to go to the tallest point in Cartagena and build a convent. He did as he was instructed and constructed a wooden church. Later on, it was replaced by a stone one. During the 19th century independence and civil wars, it was used as a fort. Columbia's political laws forced its abandonment until the Augustine Order restored it in 1964. We spent about a half hour there seeing the convent. 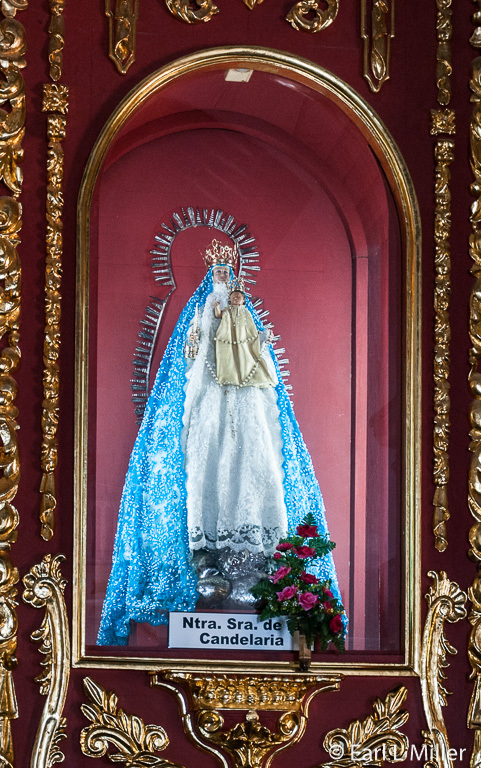 You will see the famous wooden status of the Virgin as well as a main altar beautifully laminated in gold leaf. Signage is in Spanish only so it is necessary to keep close to your guide to hear the full story. Numerous street vendors are in full attack as you return to your bus. Our next stop was a photo stop at Castillo de San Felipe de Barajas. Begun in 1535, and expanded in 1657, the fort’s battlements were arranged so if part of the fort was conquered, the rest could still be defended. Enlarged several times since, it’s touted as the greatest fortress Spain ever built in the Americas. Be sure to note its grand entrance and extensive tunnel system. The fort is located on top of a hill. Even though it has been many years, I still remember the strenuous climb to the top to shoot a panorama of Cartagena. In 1984, it was named a World Heritage Site. The vendors flood people here, too. 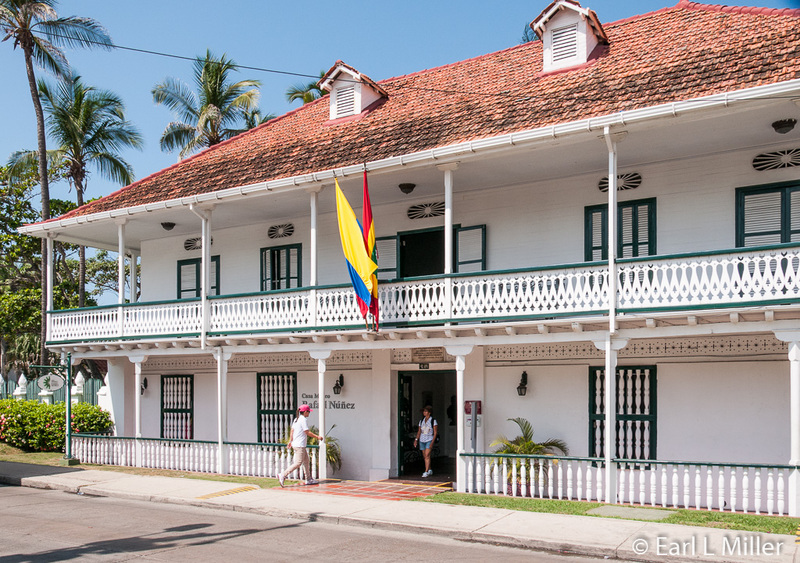 We visited the Casa Museo Rafael Nuñez, who wrote the words of Colombia’s national anthem, was one of the authors of its constitution, and was the only president elected four times. His home, an Antillean Caribbean wooden structure, is on the second floor. It is dominated by an octagonal raised patio which served as the dining room. You can see in the living room his ornate desk and extensive library. The bedroom contains the bed where he died. Downstairs, we spotted a rustic kitchen and watched two traditional dances by costumed performers. At the home, our guide offered water to counteract the harsh Colombian heat. Again the description altered from the actual tour we booked, the Scenic Drive of Cartagena & La Popa Monastery. What would have been our final stop, the Naval Museum, was made impossible by traffic and shortage of time. It would have been a 15 minute walk there with10 minutes at the museum then the walk back, part way, as our bus ran into severe traffic problems. Half of our people stayed on the bus including us. Aruba is a Caribbean port that attracts visitors for its water sports and natural attractions. It’s a country where you may want to walk from the port to the many shopping centers or, perhaps, spend your time on one of the beautiful beaches. Our ship did offer 14 tours in this port. Eight of these had increased prices if you purchased them on the ship. You can take excursions to the butterfly farm, swim with the dolphins, or have submarine adventures. Those who enjoy beaches, scuba diving, and snorkeling can find trips to do these activities. Others provide for horseback riding or relaxing for a couple of hours at an Aruba resort. With tourism so important to Aruba, I soon learned this is the port where Princess really needs to do something about their tour companies. I spoke to two different families about their snorkeling expeditions and learned they had a few problems. The major complaint for both was crews did not keep a close eye on the passengers, and some of the waters were rough. One man said he was an experienced diver who had to help other passengers while the tour staff did nothing. The other said some of the equipment, such as the goggles, did not fit. Our friends took the off road adventure and said it was like a thrill ride. Their driver was not careful and ran a red light. Fortunately, no accident occurred. In the other ports, we had a separate driver from a guide. Not in Aruba. Our driver occasionally made comments about his country. However, he never gave explanations of what we would see at the attractions nor did he ever get off and join the group. Some of the passengers wanted to be let off downtown at the tour’s end. He ignored them and drove directly to the ship. Our first stop was the Casibari Rock Formations. What you’ll see are large tonalite rocks, reddish brown in color, with unusual shapes. 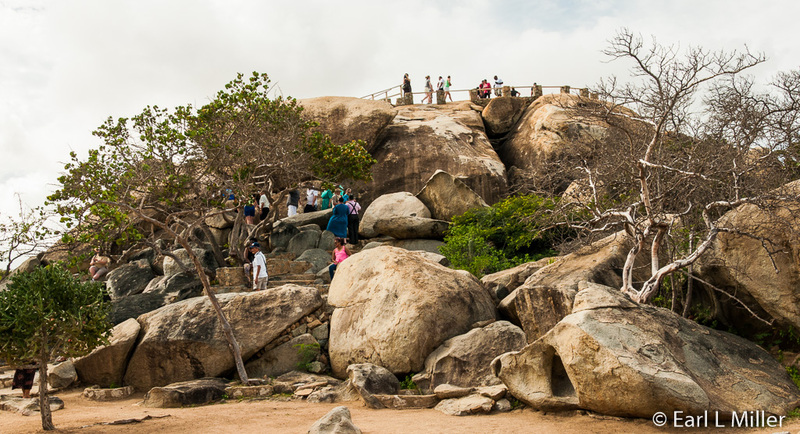 One formation is so large you can walk up its very steep trail to the top for a panoramic view of the island. Geologists aren’t sure of their origin but believe some are volcanic while other areas are coral. Take time to walk around the area as it is also a delightful desert botanical garden where you may encounter a few lizards. Across the street is a restaurant and souvenir shop. You’ll have about twenty minutes here so it’s important to use time wisely. 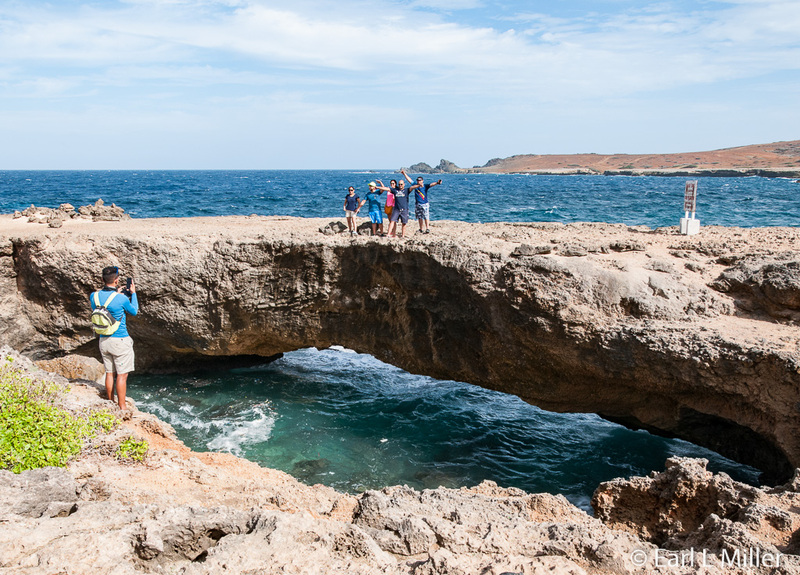 We then stopped at the Natural Bridges, Aruba’s number one attraction. The famous Natural Bridge collapsed in September 2005 and is now a blow hole. 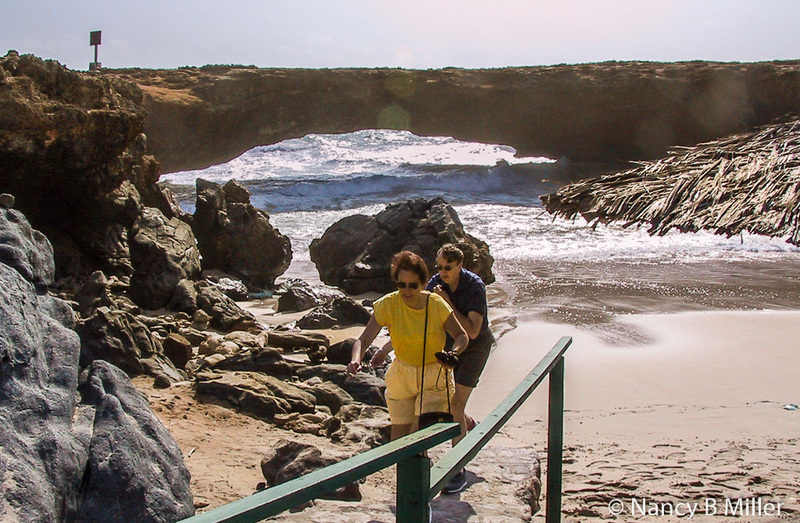 Formerly spanning more than 100 feet and 23 feet above sea level, it had been the Caribbean’s largest natural bridge. Baby Natural Bridge is 25 feet long and 3 feet above sea level. It can still be seen. These coral limestone formations were cut out by years of pounding surf. Fortunately, we had seen and photographed Natural Bridge in 2001. 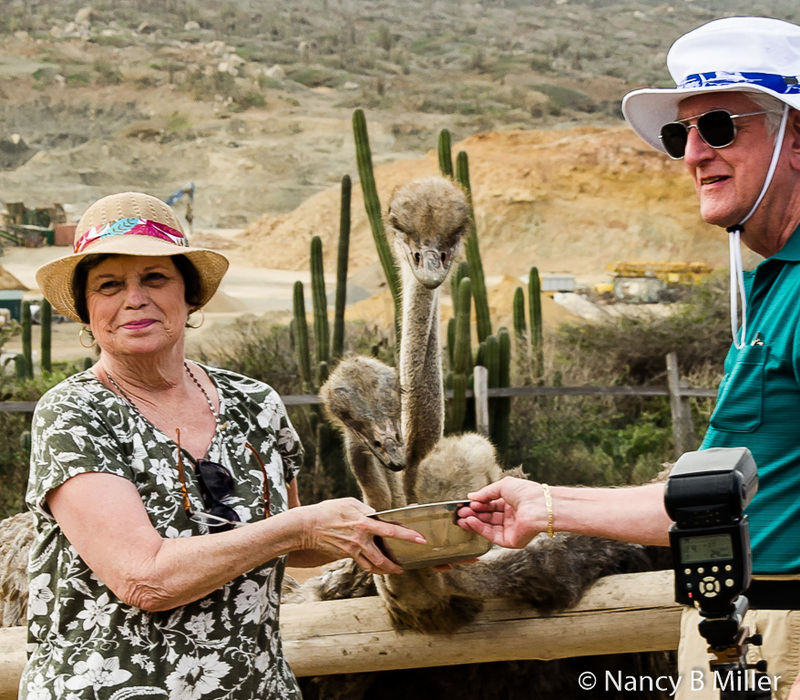 We spent around 45 minutes hiking around the Aruba Ostrich Farm. It’s inhabited by a flock of 80 ostriches and emus. The farm’s guide took us around teaching about these birds’ physiology, natural behaviors, and survival instincts. Some passengers even hand fed these hungry birds. We also visited the incubator, hatchery, and the special pens for the young ostriches and emus. Ostriches are the largest and heaviest birds in the world. Although they cannot fly, they are the fastest running birds, reaching speeds up to 43 mph. They defend themselves by using their powerful legs and 4-inch claws on each foot. They have the largest eyeball of any bird and can see as far as 2.2 miles. That may be necessary since their brain is the size of a walnut. 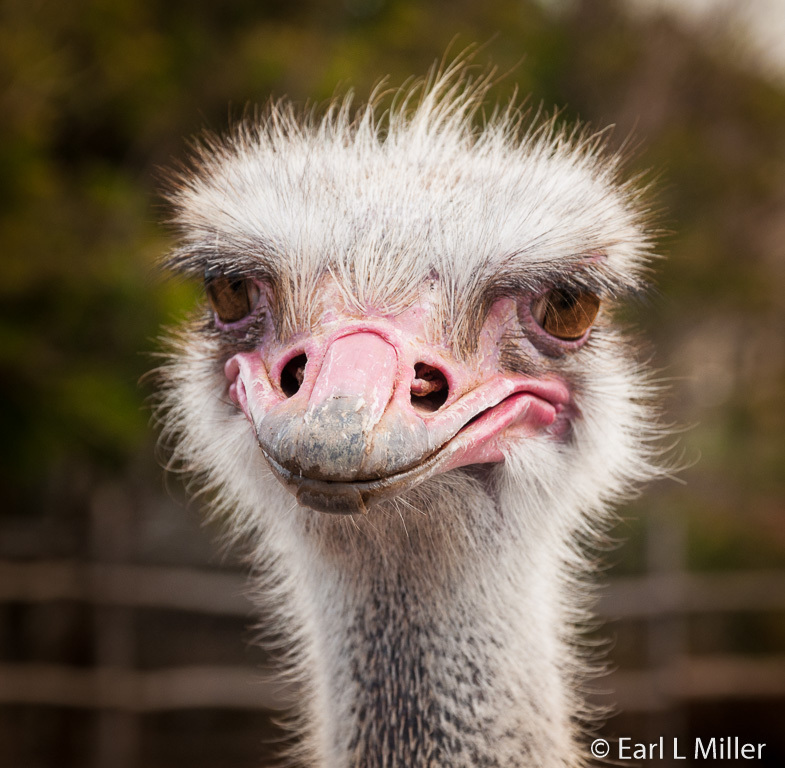 Adult ostriches carry 2.2 pounds of stones in their gizzards (their second stomachs). Since these birds don’t have teeth, they use the stones to grind their food. They can live to age 70, with 50 being average. 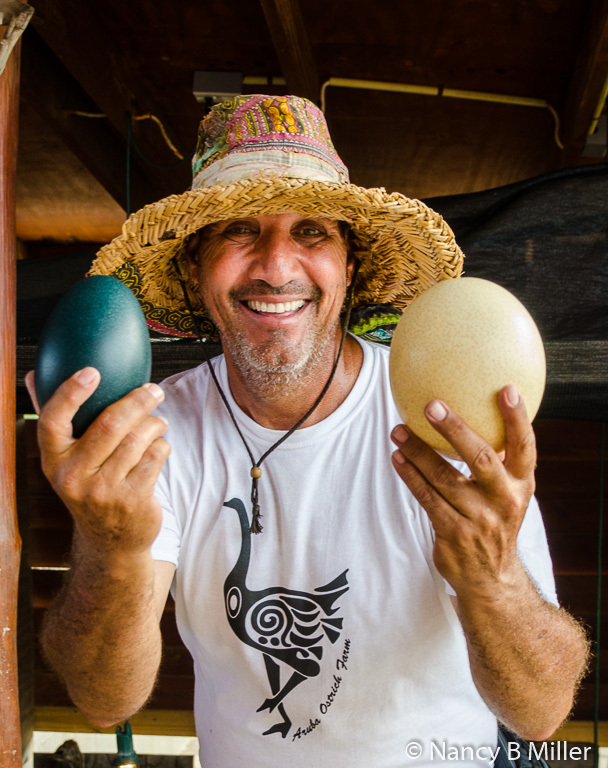 Their eggs are the largest of eggs of any bird. Ostrich meat is red like beef. It is high in protein and low in fat and cholesterol. Their cornea can be used to replace the human cornea. Emus are the second largest birds in the world. They can sprint up to 31 mph. Though they are not as fast as wild cats, their primary predators, they have one advantage. They can swivel around almost 180 degrees at full speed and take off in a different direction. Cats can’t. These birds live between 10 and 20 years. Their call consists of loud booming, drumming, and grunting sounds heard up to 1.2 miles away. Emus meat is similar to ostriches. Their oil is used in cosmetics and dietary products. Before the tour, we visited the farm’s African Art Shop. It’s full of goods from South Africa. 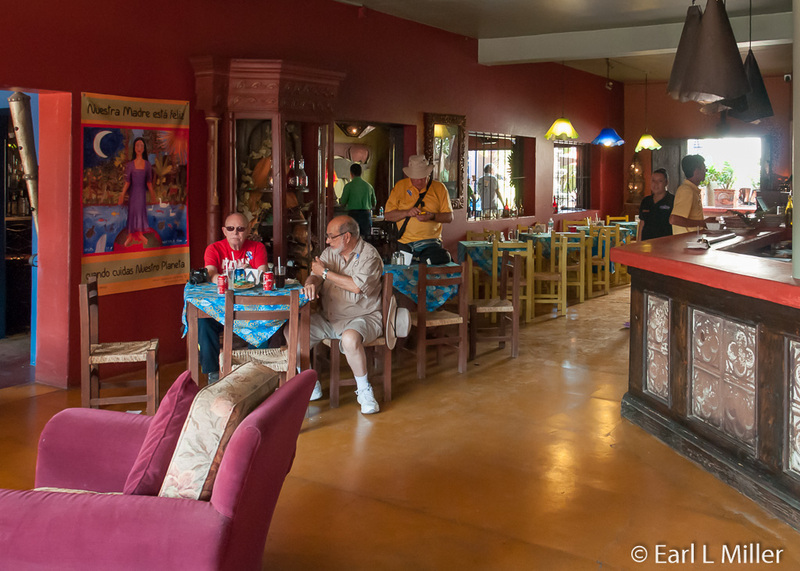 They also have a bar and restaurant on premises where you can sample ostrich meat. If you want to go on your own, they provide daily tours, every half hour from 9:00 a.m. to 4:00 p.m. for $12 for adults, $6 for children. This is an attraction I highly recommend. Our final stop, the California Lighthouse, is currently under scaffolding. A fact learned only when we reached it. It’s located on the northwest tip of Aruba. It was named after the steamship, California, which wrecked nearby on September 23, 1891. The structure was designed in 1910 by a French architect and constructed between 1914 and 1916. 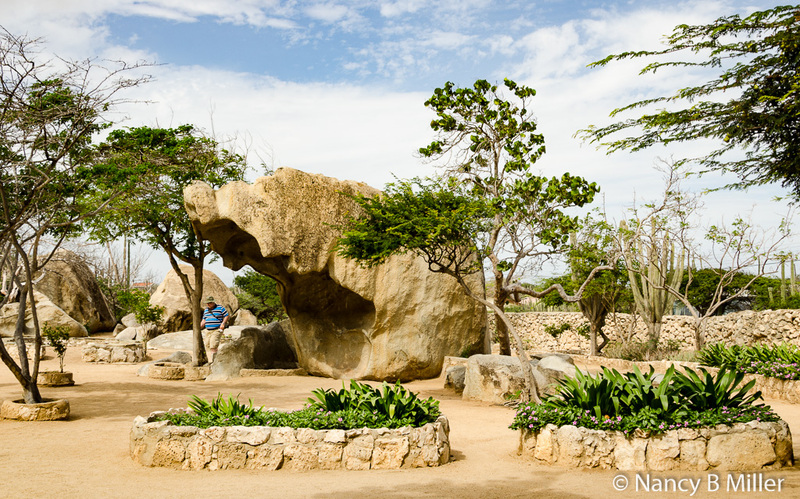 While it originally warned ships about Aruba’s coastline, it’s now a tourist attraction. We drove through Aruba’s downtown with its massive hotels on our return to the ship. We were hot, having been offered no refreshments including water, tired, and looking forward to two days of cruising and our arrival in Fort Lauderdale. Do I Really Look Like I Have a Brain the Size of a Walnut?